7. Madhur Jaffrey - As Marcella is to Italy, so is Madhur to the Indian subcontinent. She also is a great spokesperson for vegetarian, and assorted other Asian cuisines. And she is beautiful. And can act. I was so excited to see Madhur Jaffrey's name on this list. From the moment I started reading the eloquent words of her memoir, Climbing the Mango Trees , last year...I was lost in a world of Indian food, culture, and delight. Jaffrey has a way with words (read my review here). Inspired and excited by this world of spice and color, I held a Taste of India party that included Jaffrey recipes such as Murgh Korma (Chicken cooked in a Yogurt-Almond sauce), Kaddu (Indian-spiced Pumpkin), Cheese Vali Gobi (Cauliflower w/ Cheese), Phirni (Light Rice Pudding), and Neebu ka Sharbat (limeade). Many of these dishes have become favorites in our house...and honestly I can't pull out a Jaffrey cookbook without making at least three dishes at a time. You may also recognize her for her roles in television shows (such as East Enders, Law & Order, Psych) or movies (Chutney Popcorn, Flawless, Partition, Today's Special). There is so much more to Madhur Jaffrey and I hope you'll check out some of my recommended links (especially her memoir) and get to know her further. Soak the pearls overnight in water that covers them generously. Drain well the next day and leave in the strainer. Bring the milk to a boil in a very heavy, medium pan over medium heat. Add pearls and cardamom and stir them in. Adjust the heat so the milk is at a good simmer, but does not threaten to boil over, ~medium-low. Cook for ~50 minutes, stirring the bottom every 5 minutes or so (the milk should not catch at the bottom). Add sugar and stir in. Cook another 5 minutes. Remove pudding from heat and allow to cool, stirring every now and then to prevent a skin from forming. Remove cardamom seeds and place in large or individual serving dishes. Cover with plastic wrap, pressing it directly onto the surface (again with stopping a skin from forming). Refrigerate. It will thicken as it cools. I love this with the cardamom! I don't know why I like tapioca so much, I'm a texture freak and the texture IS freaky! But I love it. I'm sure I never had it THIS good before though! I have never had tapioca pearls, but I do love rice pudding. I'll add this to my to do list. I'm reading her 'Mango memoir' right now ... what a lucious read! 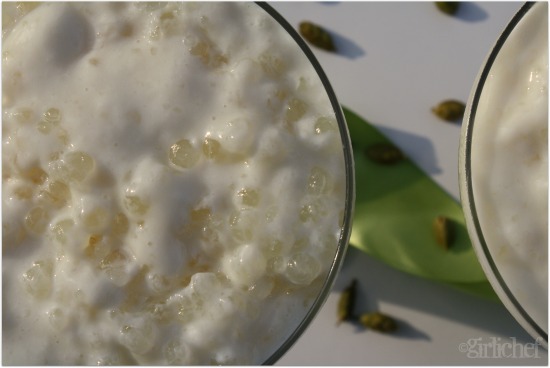 This simple tapioca pudding is so perfect! Especially after thinking on all the other more complicated dishes that you mention earlier in the post! Like coming to dessert at the end of a feast... yum! This certainly looks... interesting! Probably not something I'd make myself, but definitely something I'd try at a restaurant. 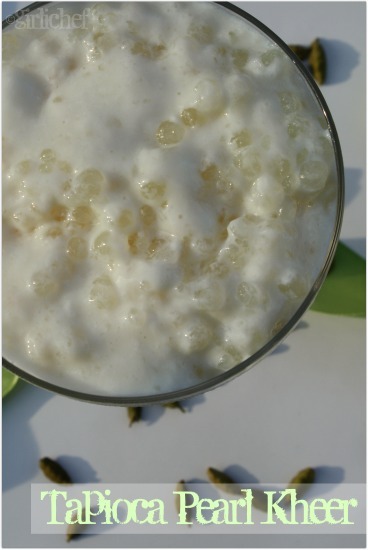 I used to looove tapioca as a kid! I have seen Madhur Jaffrey's cooking shows on the television....picked up some really nice tips. The Pearl kheer looks awesome. This dessert sounds delightful AND I have all the ingredients in my fridge right now. I've been looking for a more creative way to use up my tapioca, and I think this is it. Thanks! Hey Heather! Great post and what a fun recipe you chose. This looks fantastic! I love tapioca and cardamom. What a great combination. This dish is such a beautiful surprise. I don't know anything about Indian desserts because I never order them in restaurants...I'm always way too stuffed by the end of an Indian meal to even think about dessert. I could eat this all by itself for lunch, though! I love your photos. What an inviting simple dish to try from Madhur Jaffrey's collection of recipes. I've found her recipes very approachable, and will be trying this one. Thanks for sharing it! Mmmm...sounds like comfort food. I love your site and can't wait to read more, I'm your latest follower. If you have a moment, I would love it if you stopped by my family's blog. Have a wonderful weekend! 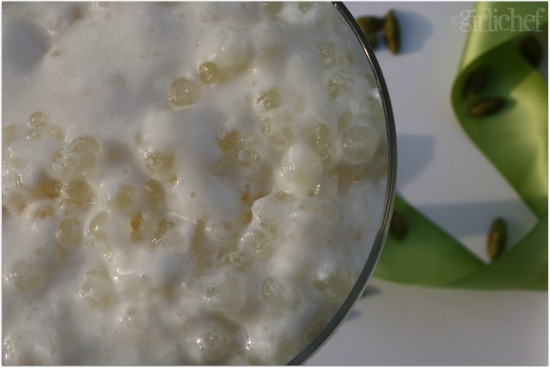 Now this looks wonderful, and I'm not a tapioca fan (texture thing). I did like the Thai basil seeds though. I will for sure look into Madhur Jaffrey. Love your 50 women posts! Thank you so much for sharing this series on Momtrends Friday Food. I really look forward to your posts each week. Have a terrific weekend and stay cool. Wow--this dish looks uniquely wonderful! I have you featured today on the FBF Hop! I have the FBF link up again this week, would love it if you could link up another recipe this weekend! I totally forgot that you had featured so many of her recipes in that Indian Food Fest a while back! I need to revisit them. Immediately. And can you imagine how happy I am that I have all the ingredients for this! SO happy. This has been such a great series and all the recipes are so good! first time seeing kheer made with tapioca pearls. My grandmother used to make this and I miss both her and eating this when she made it. Sweet memories though. Mom makes this often too & its our most fav!!! This looks creamy & luscious!!! I've got two of her books and need to get that Mango Tree. Beautiful photos Heather. Madhur Jaffrey's cooking is something I admire as well! This recipe is looking very good and tempting...so I must try out very soon! Great picture! There's lots of cardamom flavor in this one! I really want to read her latest book. It's been on my wishlist forever. Climbing the Mango Tree was such a revelation for me - I'd never made any of her recipes before then! I love creamy, milky Indian desserts, so this looks just like my sort of thing! I need to read the book and I need to make this dish. I cook a lot of Indian - in the winter. Interesting with India so hot, I still associate those spicy meals with winter. The photos look so summery though! Those shiny pearls. I just arrived back home from golidays without Internet and just had to check out all the wonderful dishes from the group! Delish BBFF!!!! Oh, I MUST make this! My husband has a thing for tapioca pearls and has been asking me to make something with them. I am a HUGE Madhur Jaffrey fan and anything from her is amazing! Thanks for the great recipe! I wonder if this tastes like boba tea.